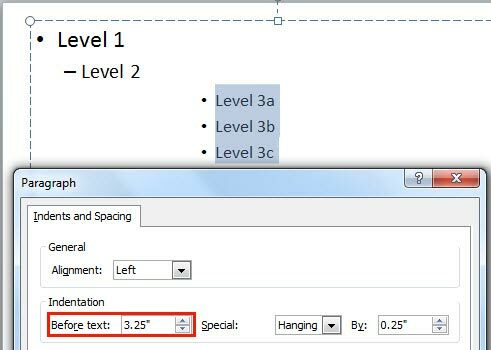 Learn how to set text indentation using the numerical values in PowerPoint 2010. When your text paragraphs comprise multiple bulleted levels, indentation becomes a must to make your text look consistent and clear. Indent Markers visible on the Ruler are probably the easiest way to achieve structured results. However, this method does not let you precisely position the indentation since you just drag and pull the Indent Markers rather than setting them up via an exact numerical value. Fortunately, you can also set indentation using set numerical values -- for this you need to access the Paragraph dialog box. First Line Indent Marker determines the beginning position of the bullet character (or the number in a numbered list). Hanging Indent Marker adjusts the spacing between the bullet character (or number) and the subsequent, following paragraph. Left Indent Marker essentially links the First and Hanging Indent Markers that we have already explained in the preceding paragraphs. 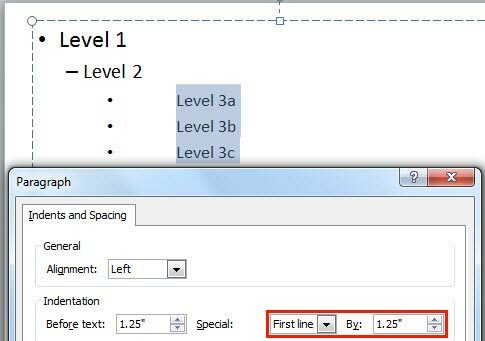 Do note that the Paragraph dialog box only lets you manipulate the First Line and Hanging indent -- you may think that you cannot control the Left indent but that's also possible although the term Before Text is used in this dialog box to signify what essentially is the Left indent setting. Select the text level for which you want to change the indentation. 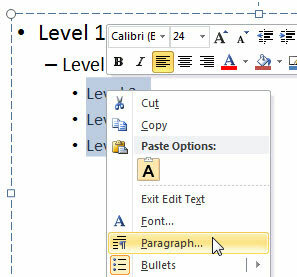 Right-click the selected text -- from the context menu, select the Paragraph option, as shown in Figure 2. Alternatively, click the Paragraph dialog launcher within Home tab of the Ribbon as shown highlighted in red within Figure 3. Either way, you will summon the Paragraph dialog box as shown in Figure 4. Also, Make a note of all the default Indentation values (highlighted in red within Figure 4). Let us explore the effect of changing each of these values on the selected text. Start with the Before Text option. Enter the required value within the box next to Before Text and click the OK button. 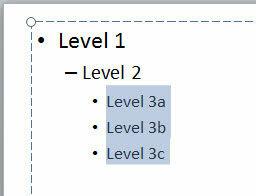 In Figure 5, you can see that we have changed the Before Text value to 3.25 (highlighted in red). Figure 5 also shows the change in the position of the selected text. Note: Unfortunately, PowerPoint 2010 does not show the live preview of any changes you make to the Indentation values within the Paragraph dialog box. You can see the actual result on the selected text only after you click the OK button. Figure 5 above shows both the changed value, and the result on the selected text just because we wanted you to see the changed value and its effect on the selected text together. It's not the live preview. Figure 6 below shows the change in the position of the selected text when we changed the By value to 1.25, with the First Line option selected (highlighted in red), keeping the Before Text value at default. 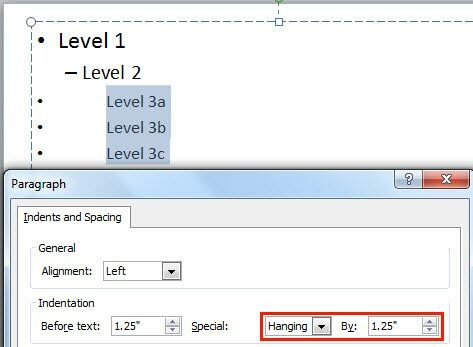 Now, look at Figure 7, where we changed the By value to 1.25, with the Hanging option selected (highlighted in red), keeping the Before Text value at default. Once the Indentation values are set as required, click the OK button within the Paragraph dialog box to apply the changes and get back to your slide. 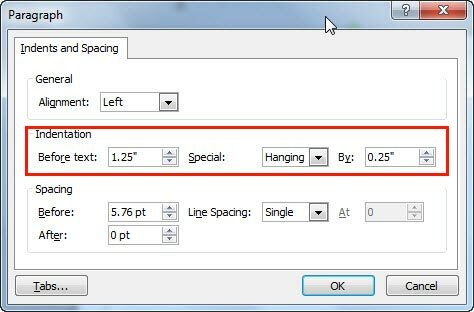 For most practical purposes, it does not matter if you choose the Hanging or the First Line indents if you only want to alter the Before Text values – both nearly get the same results. The main differences stem when the value of By option is changed – we changed this value to 1.25 while using both the First Line and Hanging indents – while the former retained the bullet characters at almost the same position while altering the position of the text paragraphs (see Figure 6 above), the latter retained the position of the text paragraphs and altered the position of the bullet characters (see Figure 7 above). Having said so, we still believe that changing indents using the Ruler is a far more intuitive way of setting indents unless you want to match indents from some existing text. Note: Instead of changing position of bullet paragraphs on each and every slide in the presentation, you can access the Slide Master view and make changes there. This way you will be making changes just once and every slide will be effected.